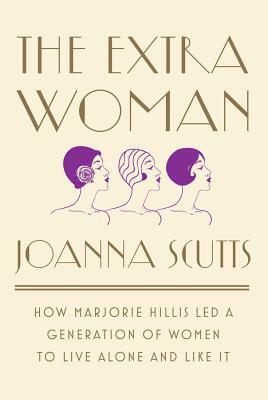 Joanna Scutts discusses her new book, The Extra Woman: How Marjorie Hills Led a Generation of Women to Live Alone and Like It. From the flapper to The Feminine Mystique, a cultural history of single women in the city through the reclaimed life of glamorous guru Marjorie Hillis. You’ve met the extra woman: she’s sophisticated, she lives comfortably alone, she pursues her passions unabashedly, and—contrary to society’s suspicions—she really is happy. Despite multiple waves of feminist revolution, today’s single woman is still mired in judgment or, worse, pity. But for a brief, exclamatory period in the late 1930s, she was all the rage. A delicious cocktail of cultural history and literary biography, The Extra Woman transports us to the turbulent and transformative years between suffrage and the sixties, when, thanks to the glamorous grit of one Marjorie Hillis, single women boldly claimed and enjoyed their independence. Marjorie Hillis, pragmatic daughter of a Brooklyn preacher, was poised for reinvention when she moved to the big city to start a life of her own. Gone were the days of the flirty flapper; ladies of Depression-era New York embraced a new icon: the independent working woman. Hillis was already a success at Vogue when she published a radical self-help book in 1936: Live Alone and Like It: A Guide for the Extra Woman. With Dorothy Parker–esque wit, she urged spinsters, divorcées, and “old maids” to shed derogatory labels and take control of their lives, and her philosophy became a phenomenon. From the importance of a peignoir to the joy of breakfast in bed (alone), Hillis’s tips made single life desirable and chic. In a style as irresistible as Hillis’s own, Joanna Scutts, a leading cultural critic, explores the revolutionary years following the Live-Alone movement, when the status of these “brazen ladies” peaked and then collapsed. Other innovative lifestyle gurus set similar trends that celebrated guiltless female independence and pleasure: Dorothy Draper’s interior design smash, Decorating Is Fun!transformed apartments; Irma Rombauer’s warm and welcoming recipe book, The Joy of Cooking, reassured the nervous home chef that she, too, was capable of decadent culinary feats. By painting the wider picture, Scutts reveals just how influential Hillis’s career was, spanning decades and numerous best sellers. As she refashioned her message with every life experience, Hillis proved that guts, grace, and perseverance would always be in vogue. With this vibrant examination of a remarkable life and profound feminist philosophy, Joanna Scutts at last reclaims Marjorie Hillis as the original queen of a maligned sisterhood. Channeling Hillis’s charm, The Extra Woman is both a brilliant exposé of women who forged their independent paths before the domestic backlash of the 1950s trapped them behind picket fences, and an illuminating excursion into the joys of fashion, mixology, decorating, and other manifestations of shameless self-love. You've met the extra woman: she's sophisticated, she lives comfortably alone, she pursues her passions unabashedly, and--contrary to society's suspicions--she really is happy. Despite multiple waves of feminist revolution, today's single woman is still mired in judgment or, worse, pity. But for a brief, exclamatory period in the late 1930s, she was all the rage.